My digital painting portrait of celebrity, Justin Hartley. Never thought would this painting take me so long (almost a whole month on and off) to finish. Accuracy and details are what I was after. My eyes are sore from staring at this too long. Maybe I need a better monitor. It's been a while since I've drawn male profile portraits. This is actually the first time I painted it digitally and I'm pretty happy with the result. I put in my time for all those details and colors as I wanted to make it perfect. What frustrated me most was the shading around the face. That took the most time trying to get it as smooth as possible. In my technique, I first started with a rough sketch using photo reference. Next, blocking in colors, which is the easiest part. Then added in the highlights. I've been experimenting with different opacity and using the dodge/burn a lot. And not to forget to mention a whole lot of mixing colors. Strands of hair using my custom brushes. I do not own the photo; just used as reference. He looks really handsome.....AMAZING JOB! I noticed that you suggested we add this portrait to our favorites collection at #CelebrityPortraits. I'm afraid we don't allow members to suggest one of their own deviations as a favorite, but feel free to submit it into our gallery by following the steps in our Info & Rules journal! Hi, please disregard it. I don't remember suggesting this deviation into the favorites. It's already approved into the gallery anyway. Thanks! 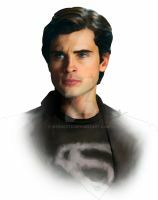 smallville is the best.! you did great btw his face is really smooth. Thanks! I thought it was too smooth looking; therefore making it look unnatural. I'm still learning with adding textures. a little bit. but keep learning. i havn't tried coloring a real person so idk but it looks hard. love it anyways. Hi! I want to invite you to join the new Smallville group, #Daily-Planet. We're trying to create a more organized group so the fans can find exactly what they are looking for. Whoa. That's some amazing detail there. I especially like the jacket! Not all shadow edges are soft, some areas are quite hard, its good to have a balance between soft/medium soft/hard edges!Just don't shade everything with the same edge. Otherwise nice work i like it! Time and effort pays dividends and this is an excellent example. Beautifully painted and you have certianly captured his personality. Love it! Wow! This picture is very pleasing to look at, and I'm just talking about how it's put together. The shading and darks, very suttley done, yet uncommonly good as a whole. This looks amazing. Lovely colours. Wow! That's amazing! The hair is so great! Lord, he's purdy! Very Nice! He's cute...I will take him home.